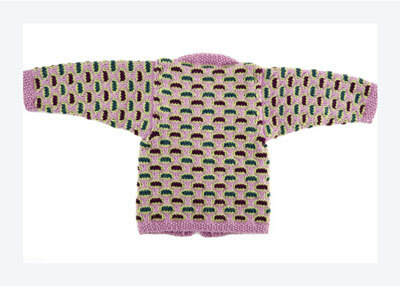 The small canvas of a baby’s sweater is the perfect place to try out a slip-stitch pattern. 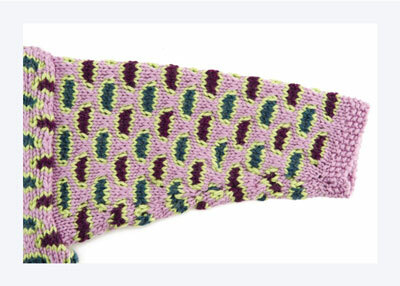 This one uses four freshly picked colors of mill-dyed superwash wool. 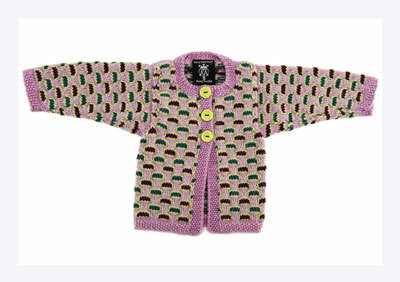 Knitted flat in one piece to the armholes, the cardigan’s simple shaping keeps seams to a minimum while highlighting the whimsical stitch pattern. Double yo: Wrap yarn around needle twice. Row 1: *K1, p1. Rep from * to end of row. With MC and smaller needles, CO 96 (112, 128) sts. Work in seed st until piece measures 3⁄4″ from beg. With larger needles, work rows 1–12 of bubbles chart. Rep until piece measures 7 (8, 9)” from beg, ending with a WS row. Next row (RS): K21 (25, 29), BO 6 sts, k42 (50, 58), BO 6 sts, k21 (25, 29). Cont working on left front only. Work even until left front measures 9-1⁄2 (10-1⁄2, 11)” from beg, ending with a RS row. Next row (WS): BO 8 (10, 12) sts, work to end of row — 13 (15, 17) sts. Next 3 RS rows: Work to last 4 sts, k2tog, k2 — 10 (12, 14) sts. Work even until left front measures 12 (13, 14)” from beg. Place shoulder sts on holder or waste yarn. Rejoin yarn to right front, beg with a WS row. Work as for left front, reversing neck shaping. 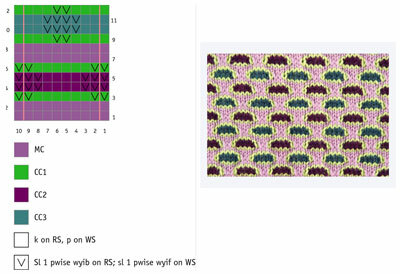 Rejoin yarn to back, beg with a WS row. Work even until back measures 12 (13, 14)” from beg. Work first 10 (12, 14) sts and place these sts on holder, BO next 22 (26, 30) sts, work to end, place last 10 (12, 14) sts on holder. With MC and smaller needles, CO 34 sts. Work in seed st until piece measures 3⁄4″ from beg. With larger needles, rep rows 1–12 of bubbles chart until piece measures 8 (9, 10)” from beg. At the same time, inc at each end of every RS MC row (rows 1 and 7 of chart) 15 times — 64 sts. Work 2 rows MC, then BO. With RS tog, join shoulder seams using 3-needle BO. With smaller needles and MC, pick up and knit 70 (82, 94) sts along neck edge, working from RS and beg at right front. Work in seed st until neck edging measures 3⁄4″ from beg. BO. With smaller needles and MC, pick up and knit 74 (82, 88) sts along edge of left front, working from RS and beg at upper edge. Work in seed st until edging measures 3⁄4″ from beg. BO. With smaller needles and MC, pick up and knit 74 (82, 88) sts along right front, working from RS and beg at lower edge. Work in seed st for 3 rows, ending with a WS row. Next row (RS): Work to last 32 sts. *Work 6 sts, k2tog, double yo, ssk. Rep from * twice more, work last 2 sts. Next row (WS): Work in seed st, knitting into front & back of each double yo from prev row. Work 2 more rows in seed st. BO. Steam bands lightly to block. 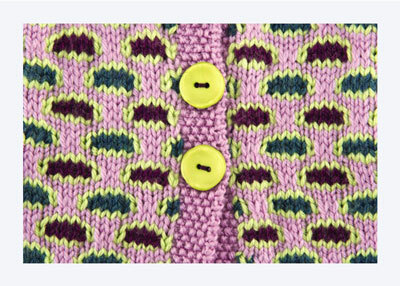 Sew buttons to left band under buttonholes.